Central tendency describes the middle or a typical value of the data set and is measured using the mean, median, and mode. Variability describes how spread out the data is. Quartiles divide a data set into four equal parts. 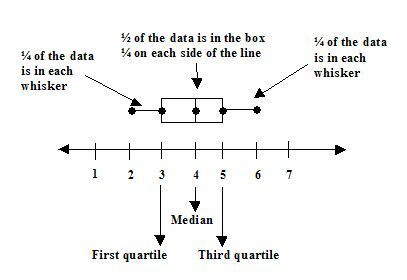 The third quartile minus the first quartile is the range for the middle half of the data. A box-and-whisker plot shows the distribution of data. The middle half of the data is represented by a box with a vertical line at the median. the lower first and upper fourth are represented by whiskers that extend to the smallest and largest values. Draw a box-and-whisker plot for the table below, that summarizes a veterinaian's record for kitten litters born in a given year. Order the data and find the smallest value, first quartile, median, third quartile and largest value. Draw the box and whiskers. Q 4: The _____ quartile is the middle (the median) of the lower half of the data. Q 5: _______ of data set is the second quartile of data set.